For the first time in 12 years, a journalist in India was targeted for execution by three gunmen on a motorcycle. Shujaat Bukhari and two bodyguards had just left the Srinagar city office of the newspaper he ran called Rising Kashmir Thursday when they were attacked. 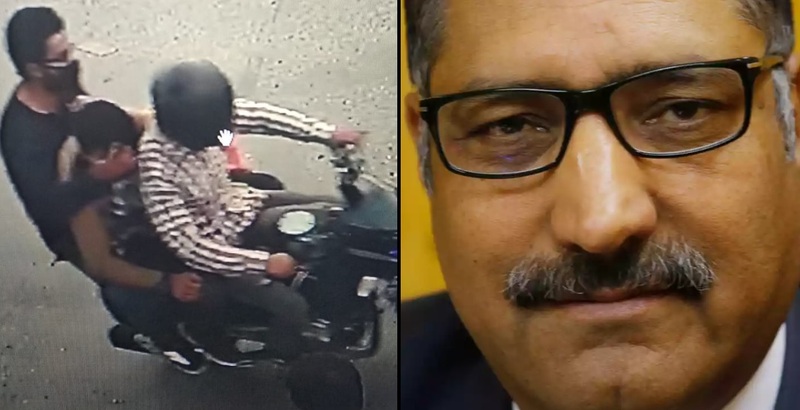 50-year-old Shujaat Bukhari was hit several times in the head and abdomen and was taken to a local hospital where he was pronounced dead. Police confirmed his death was around 7:30 p.m. Thursday, the two bodyguards also perished. Bukhari is the first journalist to be killed in 12 years in India. Since 1990 there have been 14 journalists targeted and killed in Kashmir, a remote region with mountainous terrain. The area is fought over by India and Pakistan who both lays claim to the region. Police released security camera footage showing the three suspects and asked for help identifying the men responsible for the "terror attack". The region of Kashmir is populated by militant groups which have been fighting a three-decade-long insurgency against India and its allies. No one has claimed responsibility for the attack. The newspaper owned by Bukhari, Rising Kashmir, was founded in 2008 and was one of the newspapers forced to close down it's printing press after a popular militant prompted months of bloody protests which claimed at least 100 civilian lives. Thousands more were blinded by pellets fired by the local police and Indian paramilitary forces. Bukhari said at the time of the protests that journalists in Kashmir "had to work on a razor’s edge in what is effectively the world’s most heavily militarized zone. Threats to life, intimidation, assault, arrest, and censorship have been part of the life of a typical local journalist. "If a local journalist reports an atrocity by the security forces, he risks being dubbed ‘anti-national’. Highlighting any wrongdoing by the militants or separatists could easily mean that he is ‘anti-tehreek’ (anti-movement) or a 'collaborator'." Employees at Rising Kashmir said they had just left the office when they heard gunshots. They assumed they were firecrackers set off for an Islamic festival occurring nearby but then they saw people running. The staff was "devastated" and returned to work to finish the day's edition but with a new front page featuring the deceased Bukhari. so much for bodyguards. three yahoos on a small motorcycle killed them all.